Good Morning and welcome to a new Merry Monday Christmas Card Challenge. 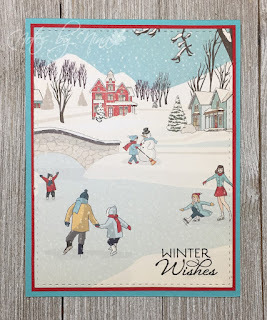 I am your hostess this week and my challenge is Create a Christmas Card with an outdoor winter activity. I have been so busy lately that my crafting time has been so I decided to go with a CAS style card. I have so many fun papers that it was easy to find one that did all the work for me. 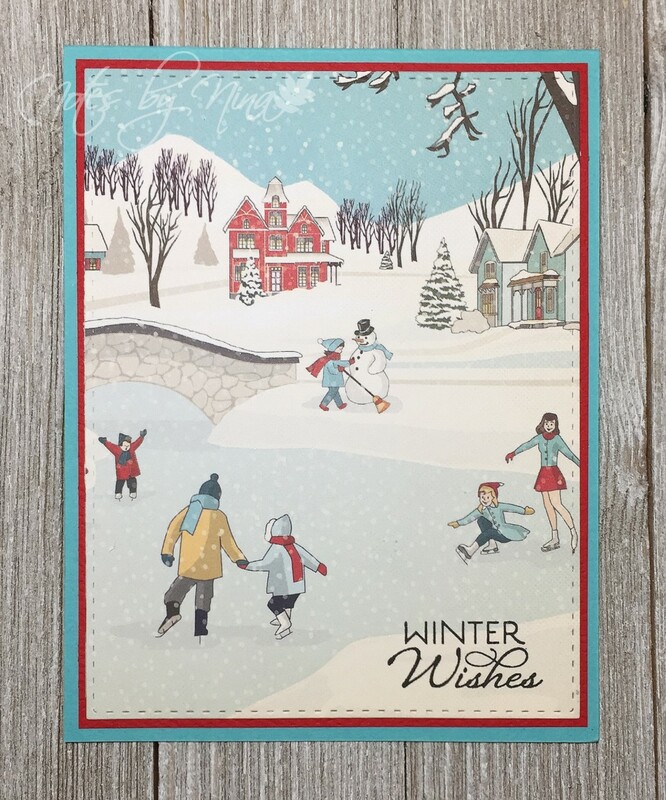 I created a card base with some turquoise cardstock, I used my stitched die cuts for the outdoor scene the added a simple sentiment and some very light sparkle along the snow edges. I also added a layer of red cardstock to pull some of the colour from the picture. Supplies: Red and Turquoise cardstock, Designer Paper - Echo Park, Verve -Glad Tidings. 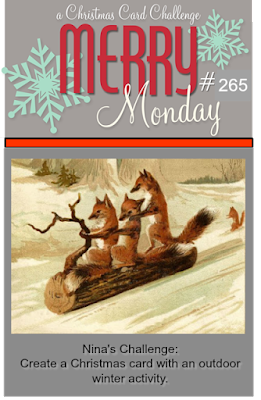 Be sure to visit the Merry Monday blog for tons if inspiration and we would love for you to play along. You have such a knack with finding the perfect patterned papers, Nina! Just love your skating scene with the sparkly snow!! Love this winter scene. So fun. Lovely card, Nina. Have a wonderful week. Sweet and a picture perfect scene for winter activities Nina! I love it! Nina, What a great outdoor scene and perfect CAS card. Have a great weekend. such a pretty card Nina! What a beautiful winter wonderland scene! Thanks for a fabulous challenge this week! I had so much fun! Your card is amazing!!! This is brilliant... great use of patterned paper! Fantastic piece of DSP Nina, love every detail of your beautiful card.